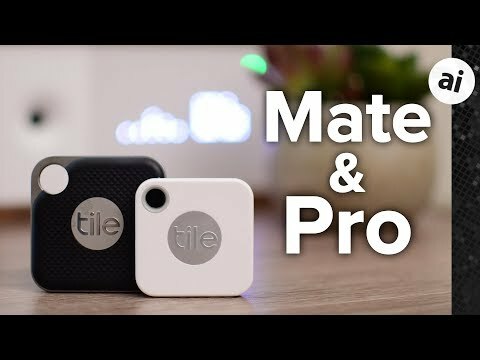 Tile on Tuesday released a pair of Bluetooth trackers, the Pro and updated Mate, with designs that -- finally -- accommodate user-replaceable batteries. AppleInsider got its hands on the products and takes them, as well as the new Tile premium subscription plan, for a spin. We will say that the new model feels a little lighter -- cheaper -- compared to the Tile Sport, though it does feel just as solid. considering the praise and the video, why only 3.5 out of 5? You don’t mention it requires tile users nearby to locate your tile. When I visit my in-laws in LA their are so many tiles compared to Chicago where I live. Of course tile doesn’t tell you how many are nearby, When I got my first tile many years ago I couldn’t even find another tile user nearby. Just like when in-laws had me switch to Waze years ago - incredible in LA traffic and Chicago traffic terrible not much use. Both much better now but still many more users in CA in my opinion. As relevant as that is, isn't the most important feature knowing where you last had your own device? I mean, if I've lost my [anything] I find that I'm always able to track it down just by figuring out when and where I last had it; or someone's stolen it. Replaceable batteries! YAY! Definitely buying into this new line. My last 'old' models are in use now. This is exactly what I was going to say! I was expecting a 4.5 rating. Do these have Bluetooth 5 yet? If not I would wait. No investigative journalism at AI to tell us the version used, just pumping out news releases. Why does that matter, besides it being a number higher than another number that is lower…? I get the tech behind it all, and I just don't see any logical reasoning for going without a tracker (if you need one) just based on whether or not it's Bluetooth 5 or not? Hey there! Just giving some color to my 3.5 review rating. Compared to the previous Sport and Style, the new Pro feels quite a bit cheaper and lighter. They are also slightly bigger than the past models. Many features that other trackers include for free are now behind the paywall of a subscription. Lastly, they are still somewhat expensive, actually raising prices over the older modes (which is slightly compensated for with replaceable batteries). In short, they are excellent Bluetooth trackers -- probably the best you can get -- but they have their downsides. Totally worth picking up, but not a slam dunk. Most likely no. Tile says Bluetooth LE, which is going to be part of Bluetooth 4.2. Call em up and ask em before going to press? When I used to write reviews for the paper I found the media relations people were more than happy to get me info for my review. I have the current Tile Pro, and will consider upgrading when the battery needs to be replaced. Has everybody developed early onset Alzheimer's? What is so hard about keeping track of your keys? Or, to put another way, if you can't remember where you put your car keys, it may be best if they stay lost. When Apple finishes it’s car codes in watch/iPhone function, 50% of Tile’s raison d’etre will disappear. How will that help track my suitcases or find my car keys etc.? I must be missing something. Thank you! I’ve never understood the need for this, unless it’s to find something that was just stolen, but only that will work if the thief is still less than 300 (or 150) feet away. How about being the least bit proactive: always put your keys and wallet in the same place at home/work. Put your purse in a visible place. Etc. I don't think you are understanding how Tile works. This from their website: "Tile connects you to the world’s largest search party so everyone using the app within range of your lost item can update its location for you." ... and I will add, for clarification, even if your lost item is 3,000 miles away. I've had Tile since they started and I've hated having to rebuy every year. Now that they've got a recurring service they can get revenue from why don't they just put in a battery system that will charge on a Qi Pad? At last! The _only_ feature that I have missed since my first Tiles arrived (I was one of the crowd-funders for the Tiles development project, long ago). Replaceable batteries! Yo! A few ornery owners of first-generation Tiles did replace our batteries with secret voodoo knowledge, but it wasn't worth it -- it spoiled the Tiles' neat appearance and certainly made them anything but water-resistent. I swapped out the "non-replaceable" batteries a couple of times just to be stubborn, and after that I replaced my expiring Tiles with new ones like a good doggie. Tile needed that semi-predictable stream of income to survive and grow, and they certainly offered existing owners enough opportunities for special pricing that periodically replacing my Tiles was not that much of a burden. FYI, there was in fact a design flaw with their first-generation products (from Tile's perspective): the first ones actually lasted two years or more before you had to replace them. That must have played hell with the business model. No question that Tiles are the best small "thing-finder" that I've found. I've tried a few of the alternative trackers and I've been disappointed by them. Why the 3.5 rating? I would definitely give it a 4.5 or perhaps a bit higher, considering the replaceable batteries. Given Tile's quality and its popularity (which constantly improves its lost-object crowd-driven finding capabilities) -- and, in general, the continuing improvements in its apps and software and the high satisfaction level of its owners -- 4.5 seems a reasonable number. So, is there something that we don't know? Halitosis? Sending the locations of our car keys to the Russians? So I can stick a Tile in a flat cap but I think glasses will be impossible - and unaesthetic too - but can anyone contradict that? I guess not. So “the world’s largest search party” is going to help me find my wallet or keys? In my house? And if it’s, say, a bicycle, why wouldn’t a thief just remove the Tile?